The Hole 3D is another unique Joe Dante-esque horror/thriller about some kids who discover a "bottomless hole" in their basement that "leads to the darkest corridors of their fears and nightmares." Quiet Earth found the first trailer, and even though it was featured at last years Comic-Con, this is the very first time it's ever appeared online. This looks like a pretty cool kids movie with enough appeal for adults. Sure, it's a little cheesy, but that's exactly the kind of horror films that Dante does well, so it should be good. I'm interested in seeing it. 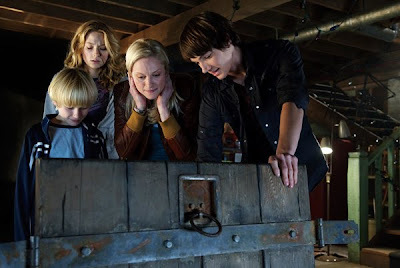 The Hole, filmed in 3-D, centers on Susan (Teri Polo), a mother who moves with her teen sons to a rural house where the three are forced to face their fears after discovering a bottomless hole in the basement. The Hole is directed by one-of-a-kind filmmaker Joe Dante, of films like Piranha, The Howling, Gremlins, Explorers, Innerspace, The 'burbs, Gremlins 2: The New Batch, and Small Soldiers. The script was written by Mark L. Smith, of only Séance and Vacancy previously. The Hole was shot independently and still doesn't have a US distributor yet. Bloody-Disgusting says it could be ready for release in the fall of this year.